Hudson Bay Coat new condition no flaws in the wool. This is made of authentic real Hudson Bay Wool wear it with or without the belt. Purchased in Maine has been carefully stored over the years. 85% WOOL 15% NYLON. THIS COAT HAS GREAT COLOR! BESIDES THE STAINS LISTED, I AM NOT SEEING ANY OTHERS. SMALLER STAIN UP HIGH NEAR COLLAR BONE. FRONT AND BACK STAIN ON LEFT WRIST. 79% Wool, 21% Nylon. Chest: Armpit to armpit: 21". Length bottom of the collar to the bottom of the hem: 30". Top of shoulder seam to bottom of cuff: 25.5". I HAVE A LOT OF PHOTOS TO SHOW DETAILS. cuff to shoulder point..24". shoulder point to shoulder point.15". This beautiful coat has pretty extensive moth hole issues. Price is very low to reflect this issue. Double breasted button closure, frontal pockets and a detachable hoodie. Style-Winter coat. This is a pre-owned item in good overall condition and sold as is. It is ivory with multi-color stripes. Incredibly warm and tons of fun. The more the points the heavier the blanket. Condition is excellent inside and out. No holes, tears or significant wear just a small amount of expected normal wear. Hudson Bay style 3 or 4 pt Wool Blanket Coat/Capote SZ S-M - Black Powder, Mountain Man.Woodsperson,Camp. Condition is Pre-owned. probably 3-4 band weight,with belt,appears to be handmade,again preowned shows age appropriate wear. Armpit to armpit, 24". Shoulder to cuff, 25". Shoulder to hem, 31". Very Good, Extra Clean Condition. Snap closure, frontal pockets and hoodie. Style-Winter coat. Length-36". Shoulder to shoulder-21". The jacket in my opinion is in good condition for its age. (as seen in pictures). Information on the history of this coat’s iconic design “the Mackinaw” can be found here What is commonly known as the multistripe point blanket originated around 1779. Coats were fashioned from these popular “Chief’s blankets” as early as the War of 1812. Wool Jacket. It has minor discoloration, a few marks and faint "old" oder. Generous front pockets. Length, neckline to bottom hem: 33". In excellent structural condition, many years of life left. It's made in England with heavy wool fabric. Coat needs some loving care, overall it is in a good preowned condition. The down seam attached to the zip needs stitches as shown in the photos. Please review all photos as they are part of the description. Thank you. 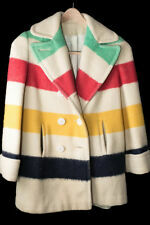 Original Hudson Bay Company Pendleton Duffle Coat Size Large/XL Circa 1950 Condition is Pre-owned. Shipped with USPS Priority Mail. Hudson Bay Co Wool Point Coat. Few small dots on it and the pocket liners have rip in them. Armpit seams have small opening on both. Vintage Hudson's Bay Wool Jacket See pictures for condition. Some wear. Measures about 31" down the back & about 23" across the chest. No size listed. Im going to say its a MEDIUM, just by trying it on. If you have any questions, please contact me! Fast shipping!! Thanks for looking! Check out my other vintage listings. Men's WOOLRICH Button Down Coat Jacket Size XL Blanket Coat Hudson Bay. Condition is Pre-owned. Shipped with USPS Priority Mail.